In this video we will discuss about, caching multiple responses for a single webform. 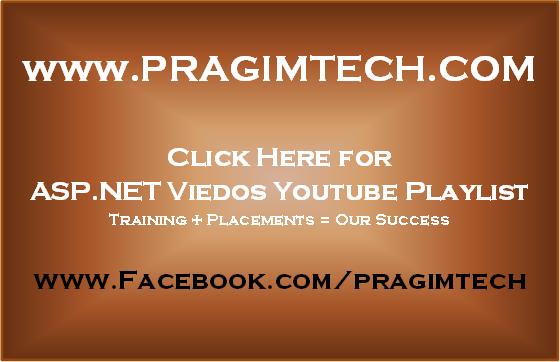 Please watch Part -119 from ASP.NET video tutorial, before proceeding with this video. First create a stored procedure to get products from "tblProducts" table by product name. This procedure returns "ALL Products", if "All" is supplied as the product name, else, only the product whose name matches with the parameter "@ProductName" is returned. Include "@OutputCache" attribute with the followig settings. Notice that, since "VaryByParam" is set to "None", only one response of "WebForm1" is cached. Now change the "@OutputCache" attribute as shown below. Since "VaryByParam" is set to "DropDownList1", up to 5 different responses will be cached for this Web form. One for each possible selection from DropDownList1 control. Leaving the VaryByParam attribute set to 'none', as shown in Listing 9-1, means that one copy of the page will be cached for each request type (GET, HEAD, or POST). Subsequent requests of the same type will be served a cached response for that type of request. Table 9-1 shows the complete set of attributes available with the OutputCache directive.